Rent arrears for council tenants on Universal Credit have jumped to more than £800,000 since they were moved on to the controversial benefit. According to figures collected by South Tyneside Council, there are now at least 286 people currently claiming the payment who owe their landlord more than £1,000 in rent arrears. Rent arrears for council tenants on Universal Credit have jumped to more than �800,000 since they were moved on to the controversial benefit. The scheme’s roll out is due to be put under the microscope by councillors at next week’s meeting of the People Select Committee. Coun John McCabe, the committee’s chairman, said: “We have provided ongoing support to help people through this major change in the benefits system. “However, we are aware that a large number of advance payments have been made which will need to be repaid and could plunge some of our most vulnerable families into further hardship. Work and Pensions Secretary Amber Rudd, admitted there had been 'challenges' with the implementation of one of the government's flagship reforms and this could have forced families to rely on foodbanks. Picture: Victoria Jones/PA Wire. 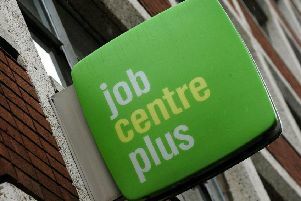 Universal Credit (UC) replaces a range of other benefits, such as Job Seekers’ Allowance, Child Tax Credit and Housing Benefit. Cash is paid monthly, with claimants expected to fully manage their own finances and pay bills, such as rent, themselves. Before the scheme’s ‘full service’ roll out in May last year, the council had already prepared for an increase in rent and council tax arrears. According to a report prepared for the committee, households claiming UC owe £834,490 in unpaid rent – more than a third of its current total arrears. Of this, more than £650,000 was already owed when they switched, making UC responsible for about £185,000 of the backlog. The controversial benefit, which is supposed to replicate the ‘world of work’, has been dogged by problems since it was unveiled in 2010. This has included problems such as delayed or late payments and a lack of support for those making the jump from weekly to monthly payments. The system was supposed to have been completely rolled out by April 2017, but now the process is not expected to be finished until December 2023. This week, Work and Pensions Secretary Amber Rudd, admitted there had been ‘challenges’ with the implementation of one of the government’s flagship reforms and this could have forced families to rely on foodbanks. The meeting is being held on Tuesday, February 19, at 10am at South Shields Town Hall.